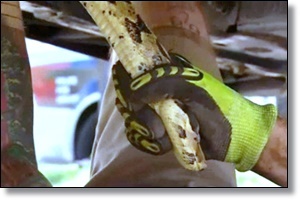 Two men pulled an 8-foot-long boa constrictor from beneath a car parked outside of a northeastern Pennsylvania medical building. The Citizens' Voice in Wilkes-Barre reports the men pried the snake from a Mercury Mountaineer's undercarriage Thursday afternoon after one saw it wriggle underneath. One of the men, herpetologist Cameron English, identified the snake as a red-tailed boa constrictor. "They told me I better not get in my car," said owner Katie Hauer, who had been inside the Geisinger Kingston medical center in Kingston borough. Hauer said she was told she may have transported the snake from where she lives to the medical building. "I'm going to be checking under my car and around my car every single day now," Hauer said. Rescuers said the snake appeared to be a well-fed pet. It was placed in a plastic container. No one was injured and it wasn't immediately known who owns the snake.